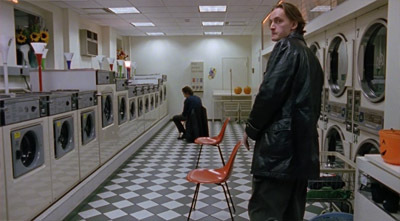 Skipping right to Scene 2, Rosencrantz & Guildenstern find Hamlet washing his bloody clothes in a laundromat. Cutting Scene 1 is an easily made cut since the audience can infer that the murder was found out and people sent to track the killer. We're only really missing Claudius' selfish reaction to it. In this modern day adaptation, the whole sequence (as Claudius walks in with bodyguards soon after being called by one of the twins) smacks of something out of a mob movie. The family never called the police, they're handling this themselves, quite possibly falsifying the details of Polonius' death to protect Hamlet from the authorities. And for that, they need the body. The laundromat is obviously redolent in meaning, a place where Hamlet attempts to wash his soul of his sin, and where indeed, we learn the King washed it from the public eye. We found out it was Halloween earlier (a child dressed as a ghost booed at the King), so there are two pumpkins on a table in the corner, and in an amusing piece of staging, Rosencrantz sits next to them during the scene, surely an attack on R&G's wits. Unlike most interpretations, they let Claudius win the scene. He comes in with a disarming smile, and Hamlet gets through his lines with fear and apprehension in his voice. The prince even tries to bolt for the door, but is pinned to the wall by the King's bodyguards. Claudius vacillates between kindness and thuggery, punching Hamlet in the gut when he loses patience with him, but wiping the hair off his brow when he finally gives up the body's location. Among the many cuts is Hamlet's seeing a cherub that sees Claudius' purposes. So only in the final disquieting kiss to his mother/father does Hamlet score a point. The look on the bodyguard's face says it all - these people are crazy. Cut to the airport, where Hamlet is given a rare farewell with a very drunk Gertrude, cold at first, then coming back for a warm embrace, an image of their last conversation in a way. Claudius stays in the limo to do his short soliloquy, and he has to get it out fast before Gertrude returns to the car. He's in his own world when she does and doesn't notice the way she looks at him, distrusting and wary. So though Scene 1 was cut, we still get a very good idea of which side she's really on thanks to her inclusion in this scene.